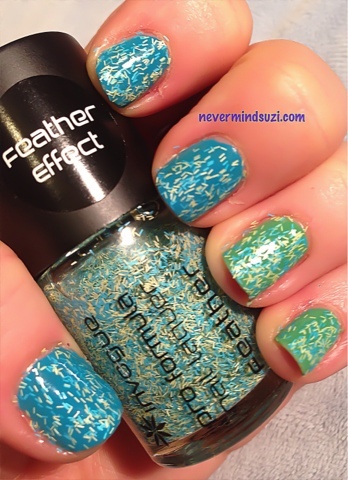 Here's a quick NOTD featuring one if the new (but much cheaper than nails inc) feathers from Invogue. On The Money is small bar glitters in blue and green. Seeing the effect I can understand why they've compared it to feathers. Not sure if its for me though. 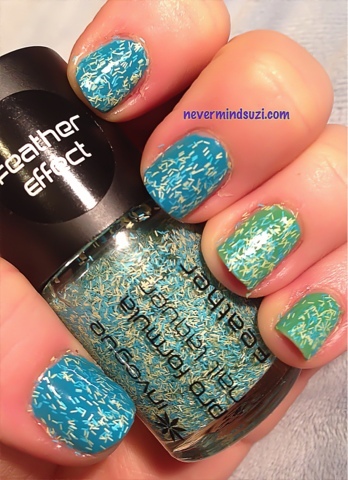 Do you think you'll be trying feathers anytime soon? Oh my! I hated the sight of feather effect at first, but it's grown on me. Want one now! I've been keeping my eyes open for Invogue at Superdrug but with no luck. I don't think I want the effect enough to spend Nails Inc money. You can order from the superdrug website and it's currently free delivery!